They don't know how they did it. The feat was accomplished in the Z machine at Sandia National Laboratories. "At first, we were disbelieving," said project leader Chris Deeney. "We repeated the experiment many times to make sure we had a true result." Thermonuclear explosions are estimated to reach only tens to hundreds of millions of degrees Kelvin; other nuclear fusion experiments have achieved temperatures of about 500 million degrees Kelvin, said a spokesperson at the lab. The achievement was detailed in the Feb. 24 issue of the journal Physical Review Letters. The Z machine is the largest X-ray generator in the world. It’s designed to test materials under extreme temperatures and pressures. It works by releasing 20 million amps of electricity into a vertical array of very fine tungsten wires. The wires dissolve into a cloud of charged particles, a superheated gas called plasma. A very strong magnetic field compresses the plasma into the thickness of a pencil lead. This causes the plasma to release energy in the form of X-rays, but the X-rays are usually only several million degrees. Sandia researchers still aren’t sure how the machine achieved the new record. Part of it is probably due to the replacement of the tungsten steel wires with slightly thicker steel wires, which allow the plasma ions to travel faster and thus achieve higher temperatures. 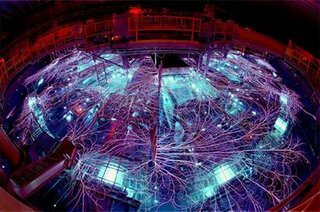 One thing that puzzles scientists is that the high temperature was achieved after the plasma’s ions should have been losing energy and cooling. Also, when the high temperature was achieved, the Z machine was releasing more energy than was originally put in, something that usually occurs only in nuclear reactions. Sandia National Laboratories is located by Albuquerque New Mexico and is part of the U.S. Department of Energy (DOE).